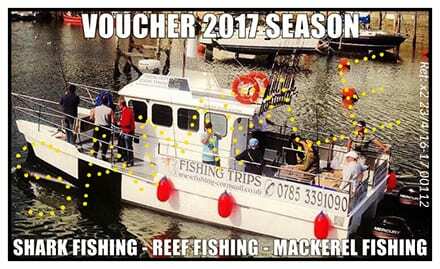 To purchase a fishing VOUCHER as a gift for someone please pay for your voucher on our payments page. To Purchase a SHARK FISHING VOUCHER pls enter £70 and the Date 2017 for the 2017 Season. If you require more than 1 VOUCHER please pay in multiple amounts. To book a trip with a VOUCHER purchased please contact the skipper direct via the contacts page, VOUCHERS are non refundable, in the event of poor weather and the trip is cancelled you will be able to rebook for another Date. Please give plenty of notice when booking your trip to ensure the dates you require are available.